Almanacs have been around a long time. The Almanac of Azarquel written in 1088 by Abu Ishaq Ibrahim al-Zarqueli is credited with being one of the earliest. Almanacs were annual publications that published information on weather and astronomy such as tides, moon phases, star and planetary movements, as well as church holy days and because predicting the stars seemed more mystical than scientific, horoscopes. This was often supplemented with good advice and most importantly lists of all kinds. Almanacs have been extremely popular in America from Revolutionary times. Most people are familiar with Benjamin Franklin’s Poor Richard’s Almanac (1773-1758). 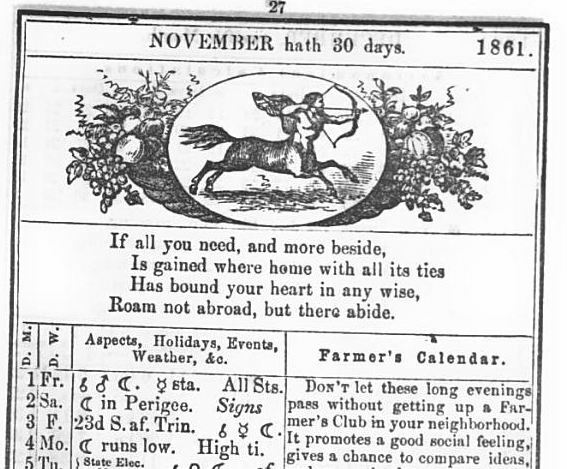 The Old Farmer’s Almanac, from which the November excerpt above was taken, was first published in 1792 and remains a familiar feature at supermarket checkouts. It is the oldest continually published periodical in the United States. During the Civil War period the public was offered a wide variety of almanacs. Besides general publications such as the American Almanac & Repository of Useful Information, Everybody’s Almanac, Uncle Sam’s Almanac, and the National Almanac and Annual Record, there were a great number of regional almanacs such as Almanac for the Pacific States, the Boston Almanac and Business Directory, Middlebrook’s New England Almanac, and the Southern Rural Almanac and Plantation and Garden Calendar. While general almanacs were ecumenical in their listing of religious holy days – the American Almanac & Repository, for example, lists not only Christian dates, but those of the Jewish and Mahometan Calendars as well – there were numerous denominational versions of the almanac. Presbyterians, Methodists, Catholics, Lutherans, and others all published their own with lists of ministers, schools, and churches. 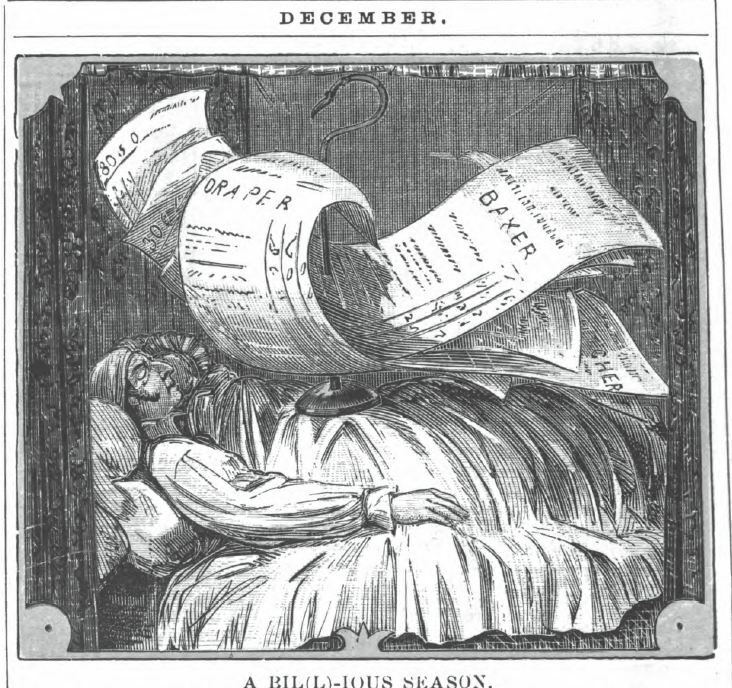 There were also almanacs published by newspapers for their clientele and those designed for specialized audiences such as farmers, sailors, bankers, firemen, and mechanics. The Banker’s Almanac provided extensive data on government revenue, exports, imports, exchange rates, coinage, the sale of public lands, and more. There was even A Confederate States Almanac published in 1865. For those of us familiar with the folksy style of the contemporary Old Farmer’s Almanac the level of information found in many of these publications may be surprising. The 37th volume of the American Almanac & Repository was published in Boston in 1861 by Crosby, Nicholas, Lee and Company. It contained not only the traditional tides and astronomical information, but also extensive listings of national and state government officers, expenditures, military, post offices, schools, election results, and similar information on foreign states as well. The 1863 National Almanac and Annual Record even included a listing for the “So-Called Confederate Government”(p. 689). Almanacs such as these, now available on the web, provide a bottomless source of data for the intrepid researcher who wants to know more about the Civil War period. Did any almanac predict hurricane Sandy? 13 days without power! Always so interesting to read your posts.